Over the last month Unite Union has put the fast-food giant Burger King under the spotlight for exploitation and attempted union busting. The union is engaging in street actions, intensified industrial organising, and legal action until the company adheres to the law and industry standards. Burger King was the last of the fast-food giants to sign a union deal after the SuperSizeMyPay campaign which took place in 2005-2006. In the years since then Burger King has kept paying below standard industry rates of pay paid by comparable companies. Conditions of work also lagged. For example, other companies agreed to 3-hour minimum shifts in 2006 but it wasn’t till years later that Burger King agreed to 2.5 hour minimum shifts. Burger King has remained as the fast-food company paying the lowest wages. For those employed at KFC the union has negotiated for staff to move to 0.96 cents above minimum wage once the first level of training is completed. In McDonald’s the staff get 0.50 cents above minimum after basic training, and in Wendy’s most staff are able to get 0.50 cents above minimum wage after six months service. These increases are attained quite quickly by most employees. However, Burger King does not agree to relativity clauses and there are instances where staff who have been employed for ten years still struggle on minimum wage. The difference is even greater in relation to higher-graded work. In KFC the line supervisor rate has been negotiated up to $19.68, however the highest union rate at Burger King is well below that with product/service coordinators beings paid $14.25. Union membership at Burger King suddenly declined in the May-June period this year and the union has clear evidence of instances where chains of management have been involved in trying to get union members to leave the union. The union has evidence that the company gave targets to managers to compel them to induce union members to leave the union. Unite has taken up such matters by putting an application to the Employment Relations Authority. Usually the reason that a company tries to influence union members to resign from the union is so that the bargaining power of the union is reduced and the union is therefore able to negotiate less improvements to wages and conditions. Essentially a union agreement – its content and how good it is – is a snapshot of the power relationship between the employer and the union membership. By reducing the size and confidence of the union membership a company reduces that union’s ability to bargain for better wages and conditions. As well as making an application to the Employment Relations Authority on the matter of undue influence on the matter of union membership, Unite has put emphasis on a number of other issues present throughout Burger King, such as exploitation of migrant workers and a culture of bullying in some stores by some managers. 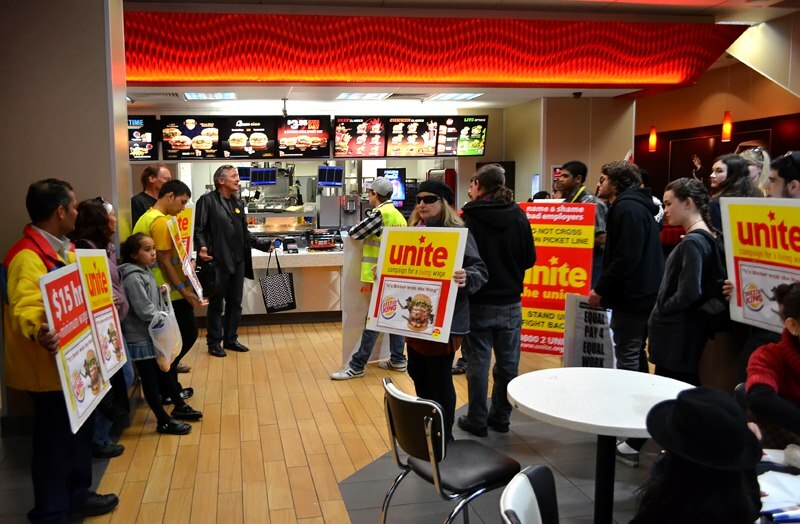 Unite lead a teach-in at the Civic Square Burger King store in Auckland’s Queen Street. This raised issues around the treatment of Burger King workers particularly from India and the Philippines. Unite has reported on working on cases where sponsorship for work visas have been unreasonably withdrawn. The threat to withdraw work visas is used to put pressure on migrant workers to meet highly unreasonable employer expectations “doing anything and everything demanded by the BK bosses in the hopes they get the prized training offer”. The teach-in coincided with the launch by FIRST union of a union migrant workers network. FIRST represents workers in the retail, wood, energy, transport, finance, and other sectors. Union officials and members have also highlighted bullying and poor management practice, including the physical assault of a worker by a manager and the practice of pad-locking fire exits with padlocks. The company claims that the union hasn’t followed procedure by contacting it first about issues before going to the media. However, the company doesn’t fix issues in the normal way when they are raised. This was shown where Unite had formally approached the company on two occasions about the pad-locking of fire-exits and yet the practice continued. Other picket actions have taken place at BK stores around the country, including by BK employees in Whangarie, Blenheim, and New Lynn. The union has also stepped up its recruitment efforts nation-wide to build the union within Burger King and to prepare for next year’s negotiations. as all your members are attending uni and have wealthy parents , will it affect you ? Personally all my working life has been in hospitality, so this directly affects me. This is also a generation that’s seen declining real wages since before many of us were born. Those of us with home-owner parents are less likely to own homes than our parents. So even those from middle-class backgrounds (which definitely isn’t everyone in the organisation) are still likely to be thrown into poverty and insecurity. Anyway, you don’t need a poor background to see there’s something wrong with capitalism, you need a brain. no u need to help the bosses by filling the country with cheap coloured labour who don’t want anything to with unions or you . these places start kids off working and they get a bit of pocket money , no one is staying there for life , im sick of the wealthy educated with degrees that they never use as they don’t have the brains anyway to get in those jobs telling me what to do , if you have a education u are wealthy !!!! just like you think all bosses are evil but in the former case its true ! take the case of Barbara Sumner Burstyn , she commutes between Canada and nz , well what a worker she is , would like to be in her position , and yet you defend her , now shes under attack its all the fault of men she tells us ! please spare me !!! !, defender of the underclass , excuse me i have to go, my plane to new york is leaving and i want a good seat in business class !!!! As a middle-aged member of the Workers Party who has slogged his guts out as a unionized worker for decades, I resent the elitist attitude expressed in the first comment. Believe it or not, young people can sometimes have a better appreciation of the realities of the system. And as Marxist strategists since Lenin have realized, successful revolution requires the involvement of classes other than the proletariat. Where would the Bolsheviks have been if Lenin sneered at the peasantry like that? No need for this space to be wasted on racism and just by the by, these days unionists from Asian and African countries run huge rings around most of us in terms of militancy. A staunch effort by Unite, but Spark writers should be aware that “exploitation” does not mean low pay or flouting the law. In marxist terms exploitation routinely takes place at the point of production, not infrequently where the pay is relatively high, where working conditions are above average and the bosses are courteous and law abiding. Yeah the second comment came through automatically because I approved the first, moderating more heavily from now on. I also find the racism of the follow-up comment distasteful. But I see you’re in Australia. If you’re in Melbourne, and come in down to the Grocon picket, we’ll both know that we’re on the same side as the students, and even the “coloureds” who are there as well. and by the way Marx never worked a day in his life , he begged relatives and others for money !!! We invite disagreement. We have had extensive debates here, linked one below. We do not invite un-constructive attacks and bigotry. Don is correct, higher paid workers also are exploited via “surplus value”, capitalism’s dirty little secret. While increased wages for BK workers are an ‘economist’ reform it is a necessary one for practical reasons alone, how are young people meant to survive? Hopefully not by regularly eating the hi salt/fat/sugar BK food substitute products. Campaigns like this one are the entry into class struggle for some young workers. BK’s ‘food’ is crappola and so is their sexist/faux macho advertising and treatment of employees. Hii this is raman working in burger king shriley christchurch and i want to join union.pls help me nd we are tired from our HRM. Tel: 0800-286-483 ext: 31, mob: 029-201-3837, lauren@unite.org.nz .